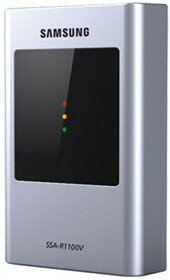 The Samsung SSA-R1101V is a Mifare smart card format 13.56MHz, 34 bit Wiegand compatible reader. It is designed with a slimmer casing and comes sealed in solid epoxy providing reliable indoor/outdoor performance. Other features are reverse polarity protection and weatherproof that make it very useful. The Samsung-SSA-R1101V has many exciting features for users of all types. The Samsung-SSA-R1101V is sold as a Brand New Unopened Item.